The printing on this stencil says "1970 Kelloggs". I guess it came in cereal. 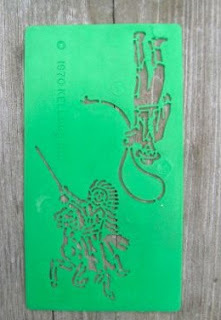 I remember stencils like this one, but not necessarily this design. We could have had it though. I remember sitting at the kitchen table tracing the lines with a pencil. Fun stuff!